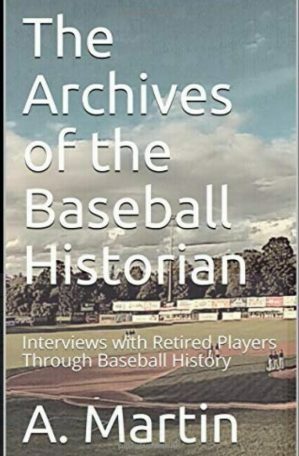 The story of the 2013 L.A. Dodgers is well known. After starting off with a 30-42 record, which left them last in the National League West on June 21 (9.5 games behind first-place Arizona), the Dodgers caught fire. From June 22-August 17, L.A. put together the best 50-game stretch in 71 years – 42 wins and 8 losses – and one of the five best since 1901. However, after the Dodgers’ 42-8 stretch upped their record to 72-50 and propelled them into first in the NL West (8.5 games ahead of the Diamondbacks), L.A. finished off the regular season with only a 20-20 record. The 20-20 close-out helped to dampen the optimism of some writers for how the Dodgers would fare in the playoffs (here and here). My purpose in this article is to examine the Dodgers’ lackluster showing in (roughly) the final quarter of the season. Had any other teams that had recorded a 40-10 (or better) stretch in a season finished as poorly as the Dodgers? Given that L.A. hadn’t started the season so well, was there a correlation between a team’s performance before its 40-10 (or better) stretch and after it? I address these questions in the remainder of the article. 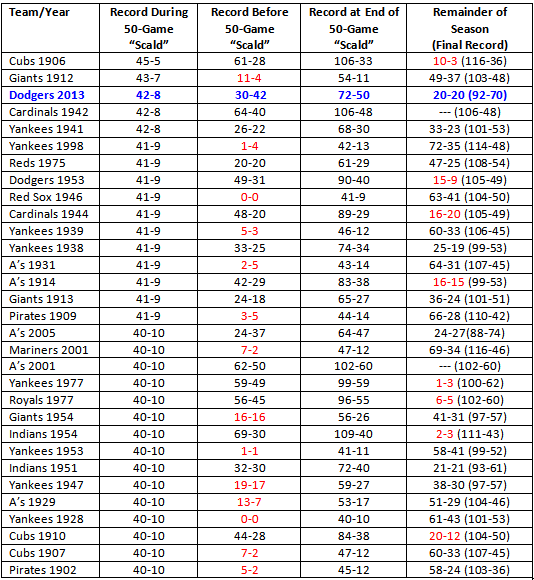 To begin, the following table shows all instances of a team winning 40 or more out of 50 from 1901 onward. One writer, rather than talking of a “hot streak,” referred to a 39-11 stretch or better as a “scald.” Even though my cut-off was slightly different, I will still adopt the scald terminology. Two additional articles (here and here) were also helpful to me as I created the table. Notes. Ties are ignored. Teams having fewer than 40 games before or after the 50-game “scald” are shown in RED. As the following bar graph shows, the Dodgers indeed had one of the weakest codas to a season that included a 50-game scald. 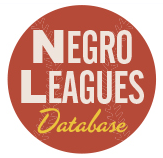 Among teams with at least 40 post-scald games remaining on the schedule (a cut-off I applied to avoid sample sizes of games that were too small), the Dodgers were among only three teams not to exceed .500 in those contests. 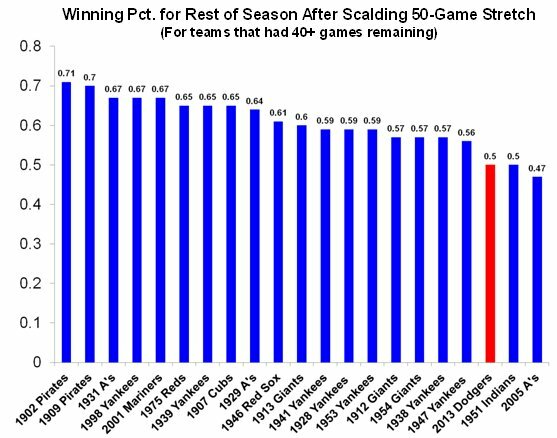 Though maintaining an .800-plus winning percentage after the 50-game scald would be unlikely due, if nothing else, to regression toward the mean, eight teams closed out their respective seasons at clips of .650 and above. The most basic thing we can see from that data is that certain teams have had a sizable “luck” quotient during their “scalds.” The Dodgers’ just-completed skein is one of those where the team won at least five additional games more than what their [Pythagorean equation] projected to be the case. Let’s move on to the next question, namely whether a team’s pre-scald record correlates with (or predicts) its post-scald record. Such a proposition suggests that the scald itself is a great departure from a team’s typical success rate, whereas the pre- and post-scald winning percentages are both reflective of the team’s underlying ability. Here is a graph of the correlation between pre- and post-scald winning percentages (again, with the requirement that a team played at least 40 games each in the before and after stages; plotting software here). The plot shows that teams’ pre-scald winning percentages indeed track well with their post-scald percentages. The correlation statistic is r = .65, although it varies slightly depending on how many places behind the decimal one uses for the winning percentages. Due to the small sample (n = 7), the correlation is not statistically reliable (p = .11, two-tailed). 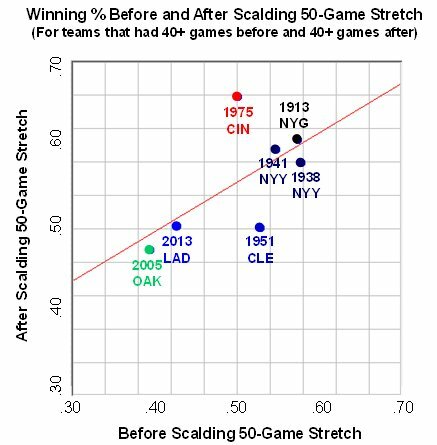 The 1975 Cincinnati Reds (aka, “Big Red Machine”) were the only team with sufficient pre- and post-scald data to play markedly better after the scald (.653, 47-25) than would have been predicted from their pre-scald record (.500, 20-20). The Dodgers were a very good team in 2013, no question. As far as such things can be determined from short playoff series, L.A. was the second-best team in the National League. Still, I think it is fair to ask: Where did the Dodgers’ scald, unprecedented as it was for 71 years, come from? 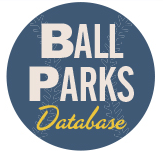 Outfielder Yasiel Puig, whose June 3 Dodger debut predated the scald by a couple of weeks, recorded OPS numbers of 1.180, .789, and .920, in June, July, and August, respectively. Shortstop Hanley Ramirez, who hardly played at all in April or May due to injury, put up OPS values of 1.086 and 1.065 in June and July (he then missed considerable action the first half of August). Pitcher Zack Greinke, who missed action early due to a brawl-related injury and then needed several starts to find his groove, finally did so. In 16 starts from July 8 to the end of the regular season, Greinke allowed more than 2 earned runs only once. Fellow starter Clayton Kershaw was similarly brilliant. In 16 starts in June, July, and August, he allowed more than 2 earned runs twice. 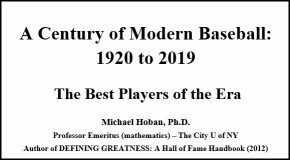 The late Robert Abelson, a Yale psychologist and statistician, once wrote about how team success in baseball involved cumulation or the ability of teams to put together strings of hits in an inning. By extension, a team would also profit from its pitchers preventing opposing teams from getting hits in bunches. That the Dodgers had so many hitters and pitchers “scald” simultaneously in June, July, and August probably best explains their 42-8 run. Alan Reifman is a professor at Texas Tech University and author of the book Hot Hand: The Statistics Behind Sports’ Greatest Streaks (Potomac Books). I am a big mets fan. Lol. Please check if the Mets had one of the top 55 game stretches including postseason. They ended up the season at 38-9 and postseason at 7-1 which is 45-10. I believe it’s gotta be in some top 10 list of best 55 game stretches of mlb whether it’s including postseason or not.